Professor Emmert is a theoretical plasma physicist with interests in plasma-surface interactions and analyzing reactor-grade fusion plasmas. Plasma-surface interactions play an important role in the release of impurities into the plasma in fusion devices; impurities increase the radiation loss from the plasma and make it difficult to achieve the high plasma temperature necessary for controlled fusion. Plasma-surface interactions also have industrial applications. Two examples are etching semiconductors for manufacturing computer chips and materials modification by ion implantation. 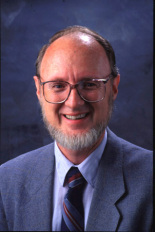 Emmert's research concerns processes by which plasma flows to surfaces; formation of sheaths and long-range potentials in plasma; the energy spectrum of ions hitting the surface; and recycling neutral gas from the surface into plasma. This work is both analytical and computational. Emmert is also involved in plasma physics questions concerning reactor-grade fusion plasmas. Areas of research are analysis and optimization of the plasma performance characteristics for conceptual reactor studies; time-dependent simulation of transients, including start-up and thermal stability; and other physics questions. This work is often computational and is being applied to advanced-fuel reactor studies.